Card Text Play: Ready and fight with a friendly creature 3 times, each time against a different enemy creature. Resolve these fights one at a time. What happens if One Stood Against Many is used on a stunned creature? The first time the stunned creature is used to fight, it would become exhausted and the stun token would be removed. No fight would take place, and no “Fight:” abilities would resolve. Subsequent attempts to “ready and fight “ with the creature work as normal. Any attempt to fight with a stunned creature will invoke the normal stun removal rules, even if circumstances wouldn’t normally allow the creature to fight, such as no opposing creatures or a card ability that prevents creatures from being used to fight. When a creature is stunned, the next time the creature is used (e.g. fight, reap, or another action) the only thing that happens is the creature exhausts and the stun token is removed. Whether you attempt to fight, reap, or perform another action, it does not resolve, nor do any abilities associated with that usage resolve (such as “Reap:” or “Fight:” abilities). Therefore, when using One Stood Against Many on a stunned creature, the creature would become exhausted, the stun token would be removed, and no fight or “Fight:” abilities would resolve, regardless of the active house or circumstances that may prevent the creature from being used to fight normally, with subsequent attempts to “ready and fight “ working as normal. When resolving the effects of One Stood Against many, can I use or play other cards in between the 3 fights (e.g. to heal my creature)? No. You must resolve One Stood Against Many as much as possible, at which point it is considered fully resolved and placed in the discard pile. Once One Stood Against Many is fully resolved, you can use or play other cards. When resolving the effects of One Stood Against many, can I choose to fight fewer than 3 times? No. If you play One Stood Against Many, you must fight 3 times with a creature, if able. If the creature you target with One Stood Against Many is destroyed before it has completed all 3 fights or there are less than 3 different creatures to fight, you fight as many times as you can, then One Stood Against Many is considered fully resolved and placed in your discard pile. Can One Stood Against Many be used on a friendly creature that is not exhausted? Yes. You always resolve as much of an ability as possible. Therefore, the creature would remain ready and then it would fight. 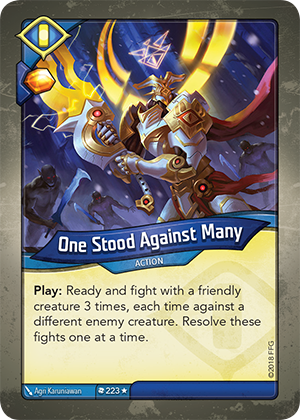 If there are no enemy creatures to fight, the “Play:” ability would not resolve, but you would still keep the Æmber bonus for playing One Stood Against Many. Can One Stood Against Many be used on a friendly creature from a non-active house? What happens if One Stood Against Many is used on a creature and there are no opposing creatures to fight? If the opponent has no creatures on their battleline, the creature is readied, but does not fight. Then, the effect of One Stood Against Many is considered fully resolved and it is placed in the discard pile. Assuming the creature is usable – e.g. via the active house or another ability – you can then choose to use the creature in a different way, such as reap; otherwise, the creature is unable to be used. If I don’t have any creatures in play, can I still play One Stood Against Many to gain the Æmber bonus? Yes. The first step in playing any card is to receive the Æmber bonus, if any. Therefore, you can always play action cards to get the Æmber bonus, but are still obligated to resolve as much of the action card as possible. If you have at least one friendly creature in play when you play One Stood Against Many, you must use that creature to resolve the “Play:” ability as much as possible. If the “Play:” ability of the action card is not resolvable, you still keep the Æmber bonus.